Does Universal Credit still make work pay? Universal Credit is a major reform to the benefit system, intended to simplify a very complex benefit system and make work pay. This post focuses on the cuts to work allowances within Universal Credit that were announced in the Summer Budget of 2015, alongside changes to the personal allowance and the introduction of the National Living Wage. These cuts will become effective today, Monday 11 April 2016, undermining the original intent of Universal Credit – to make work pay. Policy in Practice presents analysis on the ability of people to respond to lower work allowances by increasing their earnings. We find that 1.4 million working households will need to work one additional shift on average, in order to be no worse off under Universal Credit. The analysis builds on our briefing note for Lord Kirkwood for a debate in the House of Lords in October 2015 and follows on from analysis we released on the day the House of Lords held a debate on Tax Credits. Cuts to work incentives within Tax Credits were overturned, but a similar level of cuts to work allowances within Universal Credit remain in place. When it was originally proposed, Universal Credit had stronger work incentives than the current tax credit and benefit system. It was designed to reduce the effective tax rate faced by people on low incomes, a low withdrawal rate of benefits and generous work allowances. This meant that people would keep 45p of every £1 they earned, making it significantly more rewarding than the existing benefit system. The choice to enter work was de-risked by ensuring people had a stable income before their Universal Credit award began to be withdrawn. The Government’s election manifesto platform was based on tackling the deficit, reducing spending on welfare, and reforming welfare to make work pay. Overall its policy reforms to the welfare system have been popular, including the benefit cap and Universal Credit, which have had broad support. The Coalition Government first proposed an increase in the withdrawal rate from 55% to 65% in 2013, as our diagram shows, making the system broadly similar to Tax Credits in its generosity, but significantly simpler and intended to be easier to administer. The 2015 Summer Budget announced a package of measures designed to build a high wage, low tax, low welfare society. These included a higher minimum wage and income tax allowance, but also weaker work incentives. The changes to Working Tax Credit were reversed in the 2015 Autumn Statement, but cuts to work allowances within Universal Credit remain in place, making Universal Credit less generous than the Tax Credit system overall. an increased personal allowance on Universal Credit payments. We compare income in 2015, when Universal Credit had generous work allowances, to income in 2016, with lower work allowances and 2020, taking into account the full effect of the governments mitigation measures. All figures are presented on a nominal basis. In Figure 1, above, we show the Universal Credit award of a lone parent household with one child. The blue line shows the impact of a lower work allowance. At the same level of earnings, a working household would receive less Universal Credit, and a have a lower take home income. The Government should maintain support for work incentives within Universal Credit. Policy in Practice was founded by one of the architects of Universal Credit, and supports this important reform. We believe that Universal Credit will simplify the benefit system, but introducing these cuts to work allowances will not help to make work pay for low earners. Work allowances reward the lowest earning households in work, many of whom will not benefit from the higher personal tax allowance or the National Living Wage. This is exactly the group that Universal Credit is being introduced to support. By introducing these cuts, the government is prioritising the public finances over people’s personal finances, and by failing to reward entry into work it is also failing to reward personal responsibility. The Government has argued that the National Living Wage, a higher personal allowance in income tax and additional childcare support will mitigate against the cuts to Universal Credit. They also point out that nominal incomes will be protected at the point of transition onto Universal Credit, and argues that affected households can offset their lower income by working additional hours. Our analysis finds that even when these mitigating measures are taken into account, the impact of these cuts to work allowances will leave 1.7 million affected households worse off in 2020, than under the Tax Credit system or Universal Credit with its original work allowances. The changes to Universal Credit work allowances exclusively affect households that are in remunerative work. Whilst we cannot predict how people will respond to Universal Credit, we can estimate what they will need to do in order to be no worse off under Universal Credit. We assess how many households will be worse off, and the ability of affected households to increase their hours in the context of an uncertain economic outlook, weaker work incentives and a higher minimum wage. With no mitigation plan in place for people currently on Universal Credit, all households in work and on Universal Credit in April 2016 can expect to be worse off as a result of reduced work allowances. The analysis is based on DWP figures that show an estimated 250,000 households will be on Universal Credit in April 2016 and around one-third of these households are in work. 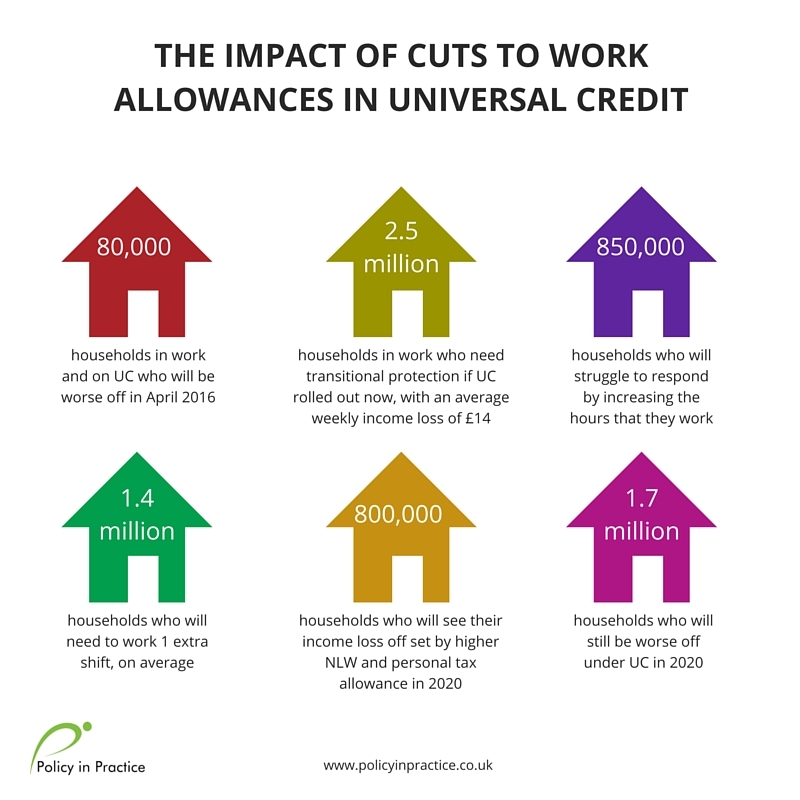 We find that 2.5 million households would see a fall in their income as a result of lower work allowances if UC were fully rolled out today, if there was no protection for people at the point of transition onto Universal Credit. This represents 75% of all households that would be in work on Universal Credit, losing an average of £14 per week. Nominal incomes will be protected at the point of transition onto Universal Credit, but this protection is temporary. Changes in circumstances such a partner leaving/joining the household or a sustained drop in earnings will mean that this protection is lost. In addition, the nominal value of transitional protection will be eroded by inflation. These households will struggle to increase the hours that they work, and will need to increase their earnings in order to be no worse off under Universal Credit. The analysis identifies 1.4 million households that could work additional hours. This group will need to work an estimated 10 million hours per week to make up for the lower work allowance. While the income loss for each household is £14 per week on average, the effective tax rate that low earners pay means that each household would have to find an additional 7 extra hours per week on average, or one additional shift. Lower work allowances will limit the dynamic effect of Universal Credit by up to 2.5m hours each week, and the OBR estimate that the National Living Wage will reduce weekly hours available by a further 1.8m hours each week. Despite a high level of job creation in the economy in recent years, the combined effects of these policies will make it harder for households to make up their shortfall by working additional hours. The number of households that would be worse off falls by approximately one-third from 2.5 million today to 1.7 million in 2020. This means that mitigating measures such as the National Living Wage at £9 per hour and the rise in personal allowance to £12,500, alongside additional childcare support, will help 800,000 households to see an increase in their nominal income, despite the lower work allowances under Universal Credit. While some households clearly benefit from mitigation measures, self-employed people, those that earn above the National Living Wage and earn below the higher personal allowance have no mitigation in place. The Government was elected to tackle the deficit and reduce welfare spending. It was also elected to reform the welfare system to make work pay. Promoting work incentives within Universal Credit rewards enterprise and endeavour, helps lower earners, and can aid progression in work. Work incentives will also help to protect the personal finances of low earners, already in fragile financial circumstances, as they transition onto the new benefit. The analysis presented here follows on from the reversal of cuts to Tax Credits analysis we did, highlighting again the challenges that arise from weakening work incentives within this Government’s flagship welfare reform. Backbenchers who rightly opposed the cuts to Tax Credits should take the same stance on Universal Credit. As we approach the next general election in 2020, they will find a growing number of hard working constituents in receipt of Universal Credit become worse off as their circumstances change. In order to truly be considered the workers’ party, and to tackle poverty in a sustainable way, the Government needs to ensure that work is rewarded for lower earners, as well as those on middle and higher incomes. To learn more about the combined effects of Universal Credit with other reforms join our next webinar Revolutionising Government’s Relationship with Data on Thursday 28 April at 10:30.